The poor, it is said, are always with us. Except when the records say they’re not. At least on an individual basis, sometimes the records tell us just what happened to a person who was down on his or her luck and ended up for a time on the public dole. Or, in Johnson County, Kansas, where The Legal Genealogist will be speaking tomorrow at the 2018 Annual Seminar of the Johnson County Genealogical Society in Overland Park, when they ended up for a time in the poorhouse. The reality for many of the very poorest members of society for many years was that they were subject to being placed–sometimes involuntarily–in warehousing and workhouse facilities variously called poorhouses, almshouses and/or poor farms. Persons who may have been in such institutions at one point or another in their lives included, but weren’t limited to, the homeless, destitute families, victims of violence, unwed mothers, orphans, the elderly, injured workers, the unemployed, the handicapped and those too ill to care for themselves or to earn a living. 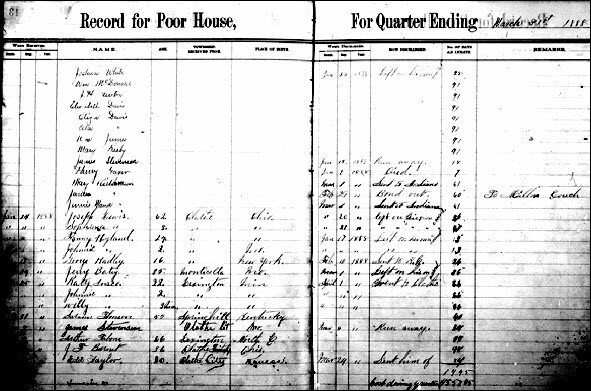 Johnson County had one of the earliest poor farms, or poorhouses, in Kansas, opening its doors in the 1860s,2 but its available records really begin in the mid-1880s. Microfilmed, available at the Kansas Historical Society and at the Family History Library in Salt Lake City, the records of the poor tell us what happened to those who didn’t want to come to the poor house and to those who didn’t stay, whether they wanted to or not. • Sophia Ewing and three children — Irena, Edna and Bird — spent 71 days there in 1889 before going to Argentine with Sophia’s husband.8 That’s Argentine, Kansas, by the way, in Wyandotte County, not Argentina as in South America. Note these are often not digitized and have to be consulted in microfilm or text format. But they’re worth every bit of the effort. Just consider what they contain: Names. Ages. Towns where they’d been living. Birthplaces. Dates of arrival. Dates of departure or death. Causes of death. Illnesses. And more. These are truly amazing records and, whether in Johnson County, elsewhere in Kansas or anywhere else in the country or the world, wherever they can be found should be prized by the researcher. I’ve tracked a good number of my ancestors in and out of London workhouses. The records are an invaluable resource, but quite upsetting. The stories the records tell can certainly break our hearts… but they still need to be told, so they are not forgotten. Had a great great Uncle who at an advanced age was sent to a poor farm in Kansas. Tried to find records but so far no luck. Know the County. From what I have been told, the poor farm kept horrible records and just buried people (no markers) in pastures. All very sad as my great great Uncle had one surviving daughter and grandson. His brothers and other relations knew he was there but no one ever seems to have gone to see him or help him even though they owned prosperous farms. The stigma of having someone in a poor farm must have been quite bad. I have a feeling he may have had dementia but not sure. He was at an advanced age when he was sent there.